Lee Wick Farm Holiday Cottages01255 823281work Self-cateringLee Wick Farm Holiday Cottages offers two cottages and seven glamping pods. The Cart Lodge (sleeps up to 10 + 2 sofa bed) has a large entrance hall from which there is a large utility room (washing machine, tumble dryer and clothes drier); leading from the entrance hall is the kitchen, dining room and the large lounge. The accommodation offers a large downstairs family bedroom (king size double and two single beds) with en suite shower room all with full wheelchair access. On the first floor there are two twin rooms, one double room with en suite and a large gallery with sofa bed. The views over the marshes and Colne / Blackwater estuaries are excellent from the gallery. Stable Cottage (sleeps 2 - 5, + 2 sofa bed) offers kitchen, diner, lounge with wood burner and French doors onto the large patio garden with views over fields to the sea. (Sofa bed provided). Bedroom one has king size bed with pull out single for family use, plus large en-suite shower room. Bedroom two has twin single beds, also with en suite shower room. There is a double sofa bed in the living area for one or two more guests. 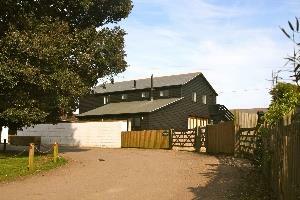 The cottage is all on one level and suitable for wheelchair users. There are three MegaPods sleeping up to 2 adults, or 2 adults and 2 children, each with double bed, double sofa bed, loo shower, kitchen sink, microwave, fridge, toaster and kettle, plus a heater and dining table and 4 chairs. Outside on the deck, you'll find a fire pit and BBQ and a table and chairs. The CargoPod, set in its own little orchard, sleeps up to 2 adults, or 2 adults and 2 children. It has a separate bedroom with double bed and sliding doors directly on to the deck. In the dining / living area there is a double sofa bed, table with 4 chairs, sink, microwave, fridge, toaster and kettle. There is a good sized loo and shower room inside too. Outside it has a large deck and grass area, with fire pit, BBQ, tables and chairs plus its own four person log fired hot tub. New for spring 2017, are our three Armadillas, each sleeps 2 adults only, in either a double bed or two single beds. Inside there is under floor heating, table, a kitchen area equipped like the other Pods, mood lighting, DVD player, Bluetooth connectivity, good storage and a loo and shower wet room. Outside you'll find a BBQ, table and chairs and also a log fired hot tub for two on the private decking of each Armadilla. Lee Wick Farm Holiday Cottages offers two cottages and seven glamping pods. Swimming pool at St Osyth beach. 9 hole golf course at Clacton on Sea. Leisure centres with pools at Clacton and Colchester. Cycle storage available. Children welcome from any age. Turn into Lee Wick Lane and continue down the lane for about ½ mile passing the farm at the top, until you reach Lee Wick Farm yard, the Cart Lodge is situated about 50 yards after the first speed bump on the left.